Founded in 1968 Germany by Ludwig Schletter senior after he realised the advantages of a material that was considered unusual at the time – aluminium – Schletter Unternehmen GmbH & Co. has gone from a small family business to a lucrative industry leader in steel and aluminium production for over 40 years. While the company maintains metal works as its core business, parts of its applications have shifted towards the development and production of state-of-the-art solar mounting systems – including modular solutions for pitched and flat roof systems, open area systems as well as a unique car port system called Park@Sol – and sustainable products from aluminium and high-grade steel. As such the company has evolved its brand to become a recognised supplier of products in the areas of solar technology and traffic engineering, trade fairs and environmental technology, as well as in customised solutions. “The emergence of the photovoltaic (PV) industry has largely driven the company’s ambition to maintain their prominence as the premier and largest global mounting structure provider and contribute to developments in as well as the advancement of the PV industry at large. This will continue with the expansion of the company into the South African market” says Nathan Venter, General Manager of Schletter South Africa. There was an added stimulus to Schletter’s market entry at the end of 2011, says Venter. South Africa’s Department of Energy had launched its Renewable Energy Independent Power Producer Procurement Programme (REIPPP) in August 2011, as a replacement for the REFIT program, in an effort to enlarge the energy mix, stimulate private developer and investor interest in the South African energy sector, as well as to, mitigate the chronic undersupply of energy. According to the department, the goal is to develop 18GW of renewable energy over the next 20 years, thereby transforming the country’s energy mix –a large majority of which comes from coal power – aligning to the international shift toward sustainability as well as mitigating the environmental impact of South Africa’s current energy generation. 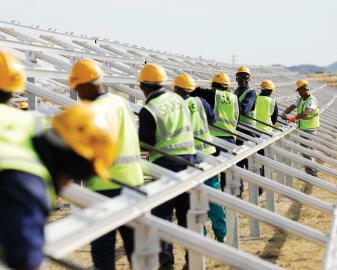 This procurement program is well advanced and as of October 2012, 28 renewable energy projects were greenlit as part of the first window of IPP bids, totaling approximately 47 billion rand. Schletter is currently involved in five of these projects, concentrating exclusively on Solar Photovoltaic mounting structures. These projects will deliver 130Mwp to the South Africa energy grid. To realise these projects the company had to expand rapidly and currently employs 12 people at the Johannesburg head office, four within the recently opened Cape Town office, another 50 in the Northern Cape and many more through the installation sub-contractors used to deliver the project. Venter says its main goals are to support its international customers with developing their renewable energy projects as well as working with locals to empower them with highly sought-after skills to guarantee market longevity and a wider scale solar PV adoption. Two of these projects – each 50MWp -being implemented in De Aar and Kimberley, Northern Cape will realise mechanical completion by the third week of August. Venter says both projects are utilising 85 per cent local content, as well as up to 70 per cent labour recruited from each location’s respective local communities. “Schletter SA delivers custom components and racking solutions developed to suit the local context. South Africa is no different with all the projects currently being implemented. In fact Schletter SA has developed and deployed three new profiles that were previously not part of the Schletter portfolio of products,” he says. Looking ahead, Venter believes South Africa and the rest of the African continent is ripe with opportunities for solar projects. Schletter SA’s successes to date will act as a catalyst for future growth and facilitate the continued expansion of the subsidiary on the continent. Solar PV is an appropriate technology for Africa given the distributed demands and insatiable demand for energy. To facilitate this end the company is also considering joint ventures to increase local content, vertically integrate and subsequently secure capacity in order to offer a greater level of security to South African and African projects, all the while maintaining the quality levels associated with Schletter. In tandem with the continued localisation of production, Venter says the company is looking to secure a larger segment of the government-led initiatives in South Africa in the second round and moving into the third.